Recent release “Impossible to I'm Possible” from Page Publishing author Juano Ocampo is both telling and emotional; this work details the author’s life during his battle with cancer, twice. Read along as Juano Ocampo depicts his courageous fight and learned optimism. 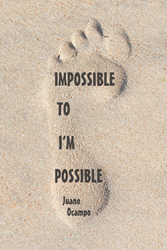 Juano Ocampo, a cancer survivor, dedicated basketball play, avid writer and author, has completed his new book “Impossible to I'm Possible”: a gripping and potent story of inspiration and acceptance. This work delves into the idea of self-identity, recovery, forgiveness, perseverance and acceptance. Published by New York City-based Page Publishing, Juano Ocampo’s honest and philosophical work delves into the meaning of life and the human psyche. This book can inspire anyone to pursue happiness. Readers who wish to experience this profound work can purchase “Impossible to I'm Possible” at bookstores everywhere, or online at the Apple iTunes store, Amazon, Google Play or Barnes and Noble.